Presentations are integral to any business. They are used on a regular basis for a whole host of reasons, from sales meetings to reports. The key to their success is in the underlying messaging. Does your presentation state your message clearly, precisely and coherently? We’re here to help cut through the waffle. Our approach is based on a deep and thorough understanding of presentation messaging, grounded by commercial experience that will help you achieve your goals. Our team comprises of experts, from across industry, who help clients optimise their content, messaging and even personal brand. They are experienced in distilling the essential message of a presentation from large amounts of data and content. The outcomes are compelling communications for leaders, sales (including key business development opportunities and bids), workshops, conferences, stakeholder, investor presentations and more. Our presentations are adaptable and don’t always conform to the typical, often cumbersome linear format. Instead, we recognise that you may need a responsive presentation that allows you to seamlessly adapt a presentation to changing requirements, even right in the moment. We introduce such flexibility without compromising on the clarity of the message. We will challenge you in a way that other agencies or internal resource cannot or won’t. We are not afraid to constructively criticise your current presentation offerings. As outsider observers, we have a good vantage point from which to decide what content is significant and what is just unnecessary padding, obscuring the message. Remember, the tougher the messaging consultancy session, the more compelling the output. Your messaging needs to identify a problem, that the audience may or may not realise they have, and solve it. The greater understanding you have of the audience’s issues, the more targeted and effective your messaging. When presenting a solution, you need to prioritise the benefits of your product/service to the audience, not spend crucial time extolling its features. Here at Ultimate, we can ensure that you strike the right balance and your audience remains engaged with the messaging. As a results-oriented agency, we monitor the impact of everything we do. We will always remain flexible in our approach to deliver the outcomes you need. Talk to one of our consultants today to learn how to improve your messaging. 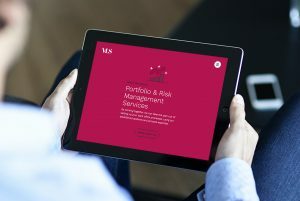 VLS is a trusted provider of risk management services, Ultimate helped them to visualise their sales messaging and company narrative in a concise and compelling PowerPoint presentation.